There are many areas of the house which can show tell-tale signs of water damage. The important thing to remember if you do spot them is there is no reason to panic, as you can always call water damage repair San Diego professionals. Sometimes is tougher to see signs of water damage in walls, especially if you don’t know what to look for. This is why we have prepared a short overview of common signs of water leakage behind walls. This seems like the most obvious sign water is leaking from inside the walls, but sometimes homeowners don’t spot it until much later on. Stains are the consequence of walls absorbing water and they usually start small and less noticeable. As they get bigger they will require a greater clean-up effort to get rid of. Look for smaller puddles on the walls and near door and windows. 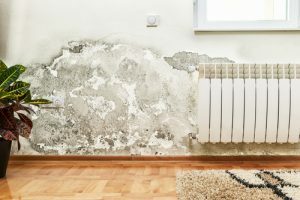 Every type of water or flood damage will cause the appearance of mold in the affected area, so you might want to check your walls and ceilings for it. An outbreak of mold can happen in any area with high levels of water and it spreads quickly, finding new breeding ground. Not only does it damage the walls and other corners, it also poses a serious health threat and needs to be dealt with promptly. Even if mold can’t be seen, sometimes in can be smelled as it emits a kind of musty odor which can also warn you of water damage behind walls. If you do smell a musty odor, follow it to see if there are any other visible signs of water damage in walls to confirm your theory. If a great amount of water or moisture has been absorbed by the drywall, it’s texture will change causing the paint or wallpaper on top of it to start peeling. When you notice peeling of paint or wallpaper separation, be careful as this means it’s high time to act. Another consequence of too much water being absorbed by drywall is when it caves and causes the wall to warp. Nearby ceiling is also in danger of sagging, possibly even falling down. So if you do see such signs, take action as soon as possible to prevent any further damage to walls and the household in general. Changes in the texture of your floors could also be indicative of water damage behind walls. If there is a hidden leak, the floors can be buckling or showing signs of discoloration. Check their seems to see if they have expanded or warped as this could mean you need to search for a water leak. The most important thing to know when dealing with water damage is that you don’t have to do it alone. As the leading expert on water-related issues, KIC Restoration provides unparalleled water damage restoration for every possible type of issue. We use professional equipment for high-quality remediation and repair, focusing on delivering the best result regardless of the challenge. Contact us to see for yourself!